Lob City? Not last night. The Memphis Grizzlies defeated the Los Angeles Clippers 106-102, ending the Clippers four-game winning streak and giving them their first loss at home. This was the Grizzlies third straight win in California, improving their record to 6-5. Maybe Slam Magazine would like to change their prediction of Clippers finishing first in the West and Grizzlies finishing sixth. Last night was the rematch of that great first-round playoff series last season when the Grizzlies eliminated the division champs Clippers. Last night’s game was almost as suspenseful with the game being tied seven times and the lead changing six times. The physicality of last season between these two conference rivals also continued last night. 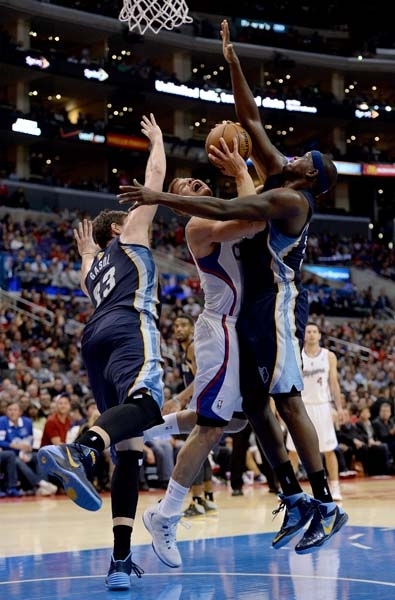 Tony Allen was ejected in the first quarter with a ‘flagrant’ foul called for kicking Chris Paul in the face. Allen went up to block Paul and the momentum of the jump propelled his leg to go up. I wouldn’t exactly call that ‘flagrant,’ and Allen made sure Paul knew it by going up to him at the foul line to apologize and declare it was not on purpose – Paul agreed it was not. Grizzlies power forward Zach Randolph recorded his 7th double-double of the season last night with 26 points and 15 rebounds – 13 of those points and 6 of those rebounds were in the first quarter. Marc Gasol almost had a triple-double with 23 points, 9 rebounds and 8 assists. Mike Conley had 5 assists and scored 8 of his 15 points in a four-minute span in the fourth quarter. The Clippers Blake Griffin had a double-double with 23 points and 11 rebounds. Chris Paul recorded his 11th straight double-double with 18 points and 11 assists. Paul ties Magic Johnson for most points, assists and double-doubles to start a season. Johnson had 11 double-doubles in the 1990-1991 season. Memphis has won three straight games in California defeating the Lakers 89-86, the Kings 97-86 and the Clippers 106-102. The Grizzlies play the Warriors Wednesday night to finish their West Coast road trip before returning home to host the Western Conference Champions Spurs in Memphis on Friday.